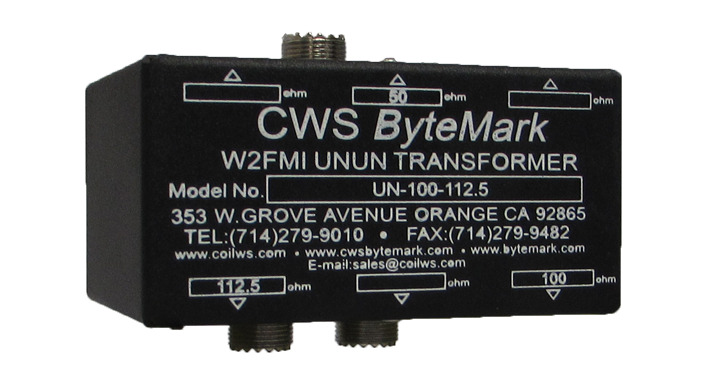 CWS ByteMark manufactures these Ununs based on Jerry Sevick's (W2FMI) designs. Broadest Bandwidth (1 MHz up to 50 MHz). Lowest Energy Loss ( < 0.2 dB). Aluminum Casing with SO 239 Connectors, on both Inputs and Outputs. "N" connectors may be available on request. Dimension: 4" x 2" x 2.8" (same for all models). Each units are tested using HP4286A. 12 months warranty. Potted version available on request at an additional cost.